The special silk hammock is suspended from the ceiling with climbing equipment, consisting of webbing straps, ropes and carabiners. Such installation allows the height adjustment of the hammock, depending on the height of Aerial Yoga practitioner. Most of the exercises are carried out with the silk at hip level, where it acts as a kind of swing, although no swinging takes place while performing the exercises. Most of the exercises start in the plumb position (string with a weight, used to determine the vertical position), which allows us to leave the ground and rise in the hammock in a calm manner. Exercises can be classified in groups, according to the position in which they are performed. 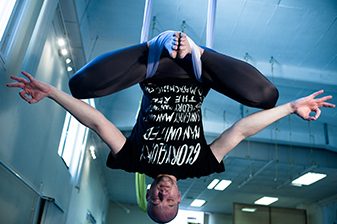 Warm-up exercises begin in a sitting, lying or kneeling position, with hands wrapped around the silk hammock. We slowly build your way up, standing in front of or behind the silk and perform exercises in which we lay one or both legs in the hammock, as well as exercises, where we the silk supports us from under the shoulder blades. This is followed by exercises, where for the first time, we leave the floor and extend the spine in a forward bend over the hammock and finally exercises, where the three-meter wide silk is spread out and we sit in it. This position is ideal for inversions, which Aerial Yoga is most famous for. During these exercises, we wrap the pelvis and thighs in the silk and put the upper part of the body in a backwards bend. Then we finally move into a very pleasant suspended position, in which the spine is completely relaxed and extended. Following are many exercises carried out in the air – where the toughest inversions leave only the shoulders in the hammock; and exercises where we start by standing up in the silk and climb even higher. For easier transition between positions, we perform some light flips, where the silk helps us maintain control over the body. These flips also allow us to connect different elements in a longer sequence, enabling a flowing transition between them and thus to dance. Attendees especially love the playful part of the exercise, because they can try out various tricks and positions that require a little more courage. The session is concluded with relaxation that gives an unforgettable feeling. We lie down in the spread-out silk, rock gently and relax every part of our body, while the hammock supports us.